Jonathan Calautti is a very humble dude indeed. Pay him a compliment about his car, and he is not too sure on how to take it or how to respond. He was shocked when I asked to photograph his ’82 XD Fairmont Ghia a few years ago I had seen the car a few times and thought that it sat well and looked the goods. It wasn’t till I got up closer to it and saw it cruising on the day of the shoot that I realised just how phat the stance is. While the Eastern Staters like to have their rides sitting nose high, Jono’s car is buried low and flat – just how it should be! For a lot of people, stance and wheel choice are the be all and end all of modified cars, and if that’s the case, young Jono has that part well and truly sorted. To be honest, the XD wasn’t really his first choice. The dream was to own an XE, but at only eighteen years old and being a little impatient, Jono decided that the XD was close enough. “My old man has owned a ridgy-didge XT GT since I was a young bloke, so I have always been into Fords. Growing up, everyone around me seemed to have XR to XB Falcons which made me think you never really seen any nice XDs or XEs kicking around. I like the square styling of the car as strange as that sounds. Some people would get that while others might not” laughed Jono. Don’t worry mate, I think there are a lot of ‘80s fans out there that dig the mid-school Falcons and even Commodores for that matter. Anyway, the XD seemed to be a pretty decent rig when he first got, and by all accounts by the owner, the car had been ‘done’ Unfortunately, the previous owner forgot to add an adverb to the end of that description. Make your own mind up on that one, but Jono decided to start pulling the car apart. The first thing on the to-do list was to take the disaster that was the engine bay and create something special from nothing. During the day, Jono is a cabinet maker/furniture maker and is a real gun with the timber stuff. With an eye for detail and a shitload of enthusiasm, he decided to tackle the engine bay redemption himself. “I started out by creating cardboard templates to create the shapes I wanted. I moved the booster to behind the dash, relocated the battery to the boot and then set about cleaning up the shock towers, welding over all the holes and even boxing in the radiator support. I reckon I have dropped about 150 hours into the bay with all the metal work and prep stuff leading up to paint” It was left to Tony at Street Rides Panel & Paint to spray the Heron White and seal the deal. With the bay looking deluxe, it was time to make something of the tired 351 Cleveland that had somehow managed to break an oil pump pick-up prior. Jeff from Streetbuilt Racing offered some sound advice when it came to the engine rebuild and also lent a hand when Jono asked nicely. The Clevo copped a tidy up ready for its freshly renovated home. Internally, the Clevo runs flat top pistons, a steel crank and a solid, flat tappet Crane cam. The ported 2V heads have had a tickle from Luigi’s head shop as well as a set of Crane Gold series roller rockers. A 750cfm Holley gets the good stuff supplied by the same brand of pump, and an MSD ignition provides the spark. Dom at Prestige Exhausts hooked young Jono up with 1-7/8 inch primaries and 4-into-1 collectors that end up pumping the gases through a twin 3-inch system. She sounds the goods now. The dedicated street motor is good for around the 310hp mark and a 12.65 @ 108mph. Backing it up is a manualised C4 box that transfers the power rearward towards a TruTrac equipped 9-inch with 4.11 gears. The body of the car remains similar to how when Jono first collected it. However, he has gone and touched it up in a few places and made some slight changes. One major improvement was the rim swap. 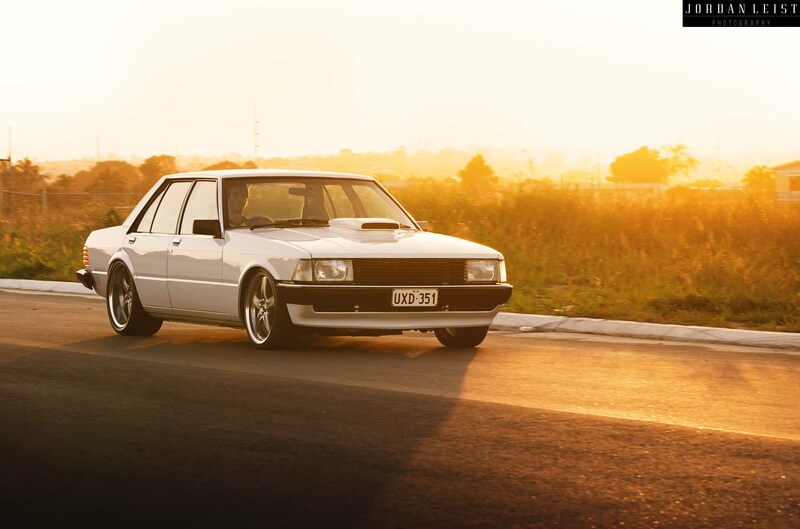 Being the good bloke that he is, Jono took off the old school Simmons that was on the car and gave them to his old man to fit on his GT and then equipped his rig with those killer ROH Modena wheels. 19x8s wearing 235/35s on the front and yep, they are 10s on the rear, shod with an impressive 305/30. If you don’t think they look any good tucked hard under those guards, well there must be something wrong with you. Under the old girl, you will find Dobinson springs, and Bilstein shocks on the front and reset leaves and Bilsteins on the back too. Inside the car is a ‘work in progress’ Jono tells me. The plan is to stick to the factory colour and theme but modernise it just a little. For the time being though, a Momo wheel, B&M shifter and some Autometer gauges do a decent job and smartening up the cabin. Built purely as a cruiser, Jono has been itching to get some more power into the car. He was a tad elusive to tell me what the full story was, but I have a feeling that something special is in the pipeline with some development coming from the team down the road at Streetbuilt Engines. Whatever the go is, I am sure Jono will be just as humble about the car.